As a longtime fan of the series, I was excited to get back into this particular season of the anime. And I can say I was not disappointed. Can't Take My Eyes Off You was a fun romp through the zany world that makes up this show. It's story, for the latter 6 episodes anyway, was touching and fun to watch, with all the craziness that one might expect from this show. The former 6 episodes were also fun, allowing some screentime to be granted to the show's massive cast. Animation wise, things were fairly good, with lots of details given to the characters's faces and close ups. That being said some of the distance shots were rather weak and it's easy to see where the budget went sometimes. Music was fairly standard and decent. Overall, if you're a fan of the series this one is definitely worth the watch. If you're new to it however, I'd recommend watching the previous two seasons, and maybe catching up with the manga before diving in here. Otherwise you might be a tad confused. Honestly, this is the only anime that never fails to make me smile, laugh, scream, and have wild mix of emotions. I LOVE this since God knows when & it's just absolutely perfect. Hope the anime doesn't end yet cuz I would love to see more of these. They're now focusing on the new characters (but I have no problem on this cus Ruka is amazing and A-tan is so darn cute omg and the rest are alright) but I kinda miss the others. AND I NEED MORE WATARU AND ISUMI MOMENTS lol. 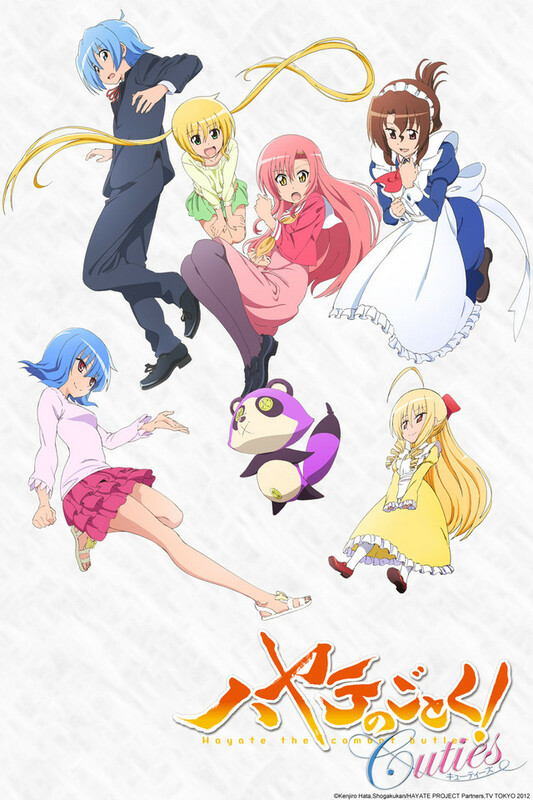 As a fan of Hayate no gotoku for long years, I highly recommend people to watch this anime And also read the manga because it's very good. Hayate no gotoku is something, so you might as well give this one a try because for me, it never brought any disappointment. I have seen season 1 and season 2 before this, and i must say if i don't find out who he goes with I will probably end up going crazy. Its a great show i would recommend it to anyone! I hope they continue with the series i would love to see more!! PLEASE MAKE MORE FOR ME AND OTHER FANS!! The great anime series comes back but not as a continuation to the original series; instead it is more like ova episodes about the characters on the second season, and more about the mystery of Nagi's heirloom watch in the first season. This is truly a funny series if anyone has ever watched the original and this spin off is just as funny with better polish of character design.